LigaSureTM utilizes heat generated via bi-polar radiofrequency energy and precise jaw pressure to denature and seal the collagen and elastin in blood vessels and tissue. Most patients undergoing surgery present with some degree of atherosclerosis. Energy ligation of vessels is common in surgery; however an evaluation specific to the performance of these devices in atherosclerotic vasculature has not been performed. The aim of this study was to examine the utility of the LigaSureTM device in high grade atherosclerotic vasculature in a validated porcine model. Model: Yucatan miniature swine (n=7) were chosen with an identified genetic locus predisposing them to atherosclerosis. A standard Yorkshire pig was used as a non-atherosclerotic control. Experimental animals were fed a high fat diet two weeks pre-operatively. The control animal was fed a standard pig chow diet. The femoral and iliac arteries were accessed via standard femoral cut down and denuded with a 4 French Fogarty catheter. The animals were recovered and fed the high fat diet for 28 weeks postoperatively. Base line and monthly cholesterol testing was performed. 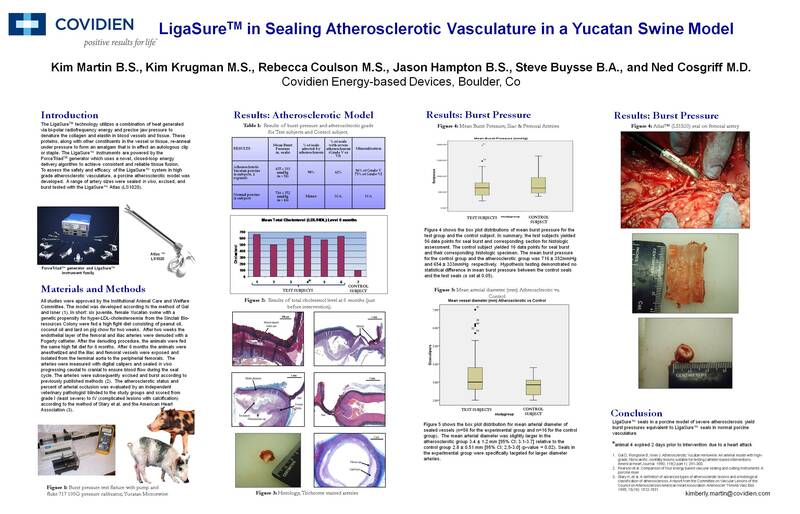 LigaSureTM Seals and Burst Pressure Testing: At 28 weeks the animals were anesthetized and the relevant arteries exposed. Artery diameters were measured in vivo with digital calipers, sealed and divided in vivo with the LigaSureTM Atlas. Sealed artery sections were excised with the side of the seal proximal to the aorta subjected to burst pressure testing as previously described by multiple authors. The half of the seal distal to the aorta was kept intact for histological and morphologic analysis. Histology: Arteries were stained with H&E and modified trichrome. The slides were evaluated by an independent veterinary pathologist for atherosclerosis grade using the system developed by (Stary, et al., 1995), and for seal quality. The percent of the circumference of the intima (in cross-section) affected by atherosclerosis was calculated along with mineralization (calcification). severe atherosclerosis (Grade V or VI fibroatheroma) observed in 62%. Mineralization wasobserved in 86% of Grade V and 75% of Grade VI fibroatheromas. In all of the Grade VIsites and many of the Grade V sites, 100% of the scored cross-section was affected. Mean percent of luminal occlusion by morphometry was 30% (+ 0.025). Control animals were normal. Cholesterol levels were elevated in the experimental animals (n=7) mean=617 mg/dl relative to the control animal mean =128 mg/dl. In arteries 2-3 mm in diameter mean burst pressure for the atherosclerotic seals (n=35) was 741 (+363) mmHg, 95% CI=620-861. Mean burst pressure for the control animal seals (n=16) was 716 (+352) mmHg, 95% CI=599-832. Student’s t test was non-significant. There were no seal failures in either group. In addition, 18 vessels in the 4-7mm size range (mean 4.7 +1.1mm) were tested in the atherosclerotic animals. Mean burst pressure was 482+180 mmHg with no seal failures. LigaSureTM seals in high grade atherosclerotic porcine vasculature are equivalent to seals in normal porcine vasculature in terms of burst pressure.